Want to travel to your desired destinations via Philippine Airlines? Check these PAL promo fares for trips to international destinations. The Philippine Airlines sale tickets are valid for travel from March 1 to November 30, 2018. Thus, you may book the low fares for your summer or pre-Christmas holidays. PAL international promo fares are good for roundtrip travel and inclusive of government taxes and surcharges. Philippine Travel Tax and travel agency fees are not included in the fare. 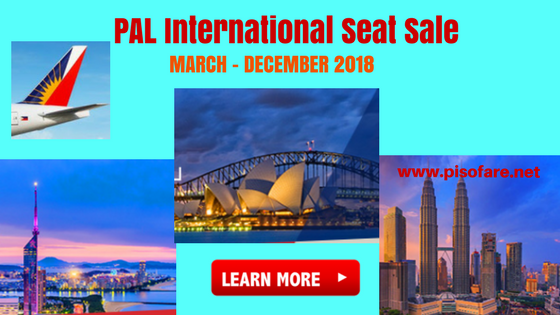 Sale seats of Philippine Airlines have limited availability! First Come, First Serve basis! Tickets booked online can be paid via Online Payment with use of Credit Card, Debit Card, Alipay, PayPal. Another option is to pay thru Payment Center. Payment of tickets via Payment Center is not applicable when you want to get ancillary services like Prepaid Baggage, Travel Insurance and other services. Philippine Airlines promo ticket entitles a passenger free 7 kilos hand carry baggage and free checked allowance which varies according to flight route. There is no child discount on this promo. Infant under 2 years of age without a seat is charge 20% of adult ticket rate. For more promo fare updates of Philippine Airlines and other airlines, Follow our Facebook page: PISO FARE TICKET!